Indigent Defense Services and the Duke Law Center for Criminal Justice and Professional Responsibility are pleased to announce a free CLE, This program will take place on March 20, 2015 at Duke Law School. 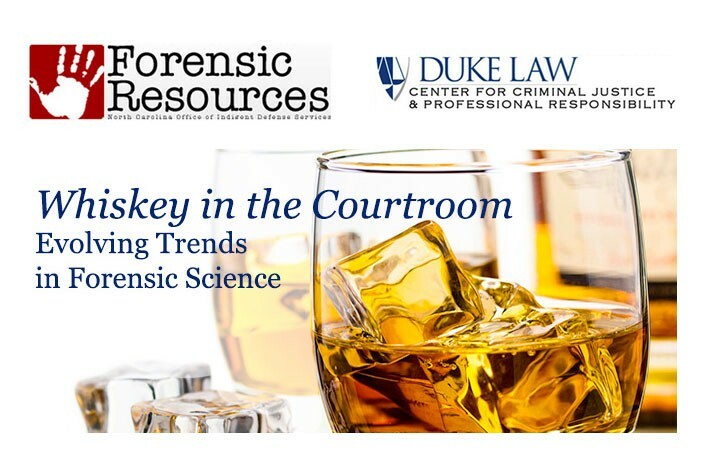 Forensic science experts and attorneys who have litigated cases involving complex scientific evidence will present on a range of topics designed to help attorneys understand the latest trends in forensic evidence, limitations to this evidence, and legal challenges that can be made. The program begins with a “science fair” of forensic experts from 10-11:15 a.m., offering a unique opportunity for attorneys to speak one-on-one with experts to gain a general understanding of the state of the disciplines and/or have specific questions answered. The panel presentations begin at 11:15 am. 5.25 hours of CLE credit is anticipated for the presentation portion of the program. This program is free, but registration is required as lunch will be provided. Please click this link to find out more about an upcoming event addressing the school to prison pipeline: School-to-Prison Pipeline JJI and NABJA revised 1 16 15 (4). 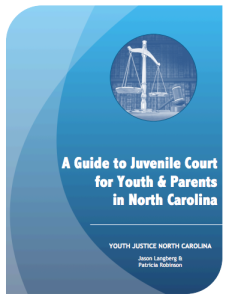 Wake County Public Defender’s Office is sponsoring a free CLE for anyone who handles criminal matters for youth who are in DSS custody or involved with CPS investigations. This can include 16 and 17 year olds in adult court. The CLE will be held somewhere in downtown Raleigh (still working on place). CLE credit approval is pending. You would have to pay the NC State Bar for the 3 credit hours (current rate is $3.00 per hour) but you do NOT have to pay anything to attend. I will send more information and sign up forms soon but wanted to get the word out so you can clear your calendar to join us. There are a few common ways our kids end up being held illegally. As their advocates, we need to focus on ways to try to prevent this from happening, and what to do when it comes to our attention that it has happened. Often, these days are included as a part of the initial order, but stayed while the child is under various terms of probation. We, the child’s lawyer, then close the file and file our fee applications. We tell the child to contact us if they have questions, but unless an MFR is filed, we typically do not hear anything more about the case. In other cases, judges will explicitly authorize the court counselor to use some or all of the stayed days upon “noncompliance” or a particular type of violation. In either case, in some jurisdictions, court counselors will approach a judge with a secured custody order to utilize some or all of these stayed days for noncompliance issues. The child is then picked up, and serves their days. When they are released, they continue on probation. Because the child has not been brought in on an MFR, there is no due process and no appointment/reappointment of a lawyer. So this happens in a way that we typically are completely unaware that it is happening. In re Hartsock provides that the judge cannot delegate her authority to court counselor to determine if certain dispositional alternatives are appropriate. 158 N.C.App. 287, S.E.2d 395 (2003). By authorizing the court counselor to impose stayed intermittent confinement days, there is an impermissible delegation of authority. Additionally, when the imposition of these days is for an alleged incident(s) of noncompliance with the probation order, there are due process requirements of notice (an MFR) and a hearing, as well as the (re)appointment of a lawyer. If we find out this has happened, it is usually if we see the secured custody order in the file after being appointed on new charges or an MFR at a later date. At that point, the child is no longer in custody, and there is no proper recourse for a juvenile defender to take. So, what do we do? I have a couple suggestions. The first is proactive. 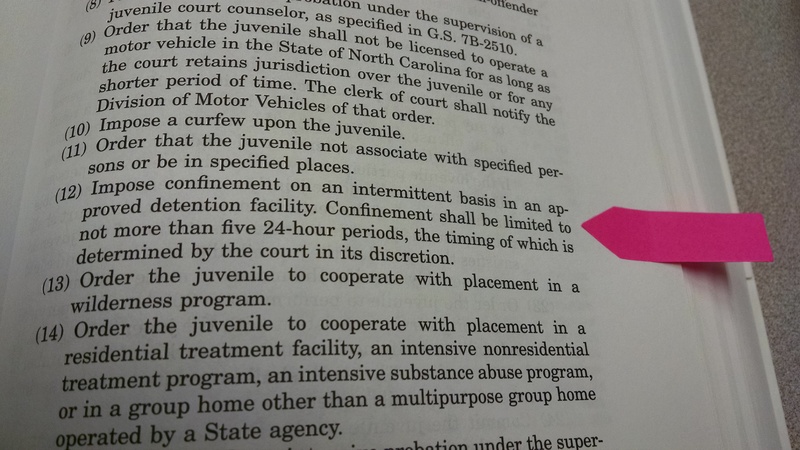 When you are at disposition for a child and the judge indicates she will include stayed intermittent confinement days as part of the order, ask for there to be language that specifies that the days cannot be imposed unless the child is brought back in front of the judge on an MFR. Cite Hartsock when making this request. I have had success with some judges in getting this language into the original order. This makes it clear to the court counselor and any judge the court counselor may approach with a secured custody order that the days cannot be imposed without the proper due process proceedings. If the judge refuses to include this language, consider appealing. Appeals can (and often should) be made on dispositional issues even if the child took a plea. Once disposition has been entered, you have 10 days to appeal. If the 10 days expires, and the child is later confined illegally in a manner in which you are not aware until the confinement has ended, there is no legal recourse in the delinquency venue. What if you learn about the illegal confinement while the child is still locked up? You can file a writ of habeas corpus. Since this is a complicated procedure, I will not go into details on how to do this in this blog post. Contact OJD and/or the Appellate Defender’s Office for assistance if this happens. On a systemic level, I would encourage all juvenile defenders to review the court files of their clients to see if this is occurring in your counties. If it is a regular occurrence, consider speaking with the court counselors, DAs and/or judges about the practice. If this is something that is happening regularly in your counties and none of these strategies seem to be working, raise the alarm. Contact OJD, so they can be aware of how widespread the problem is. And do not stop objecting to this practice! Kellie Mannette (http://mannettelawfirm.com/) is a private attorney practicing in Orange, Durham and Chatham counties who specializes in criminal and juvenile defense. An alumnus of the UNC Youth Justice Clinic program, Kellie has returned twice to teach at the Clinic.